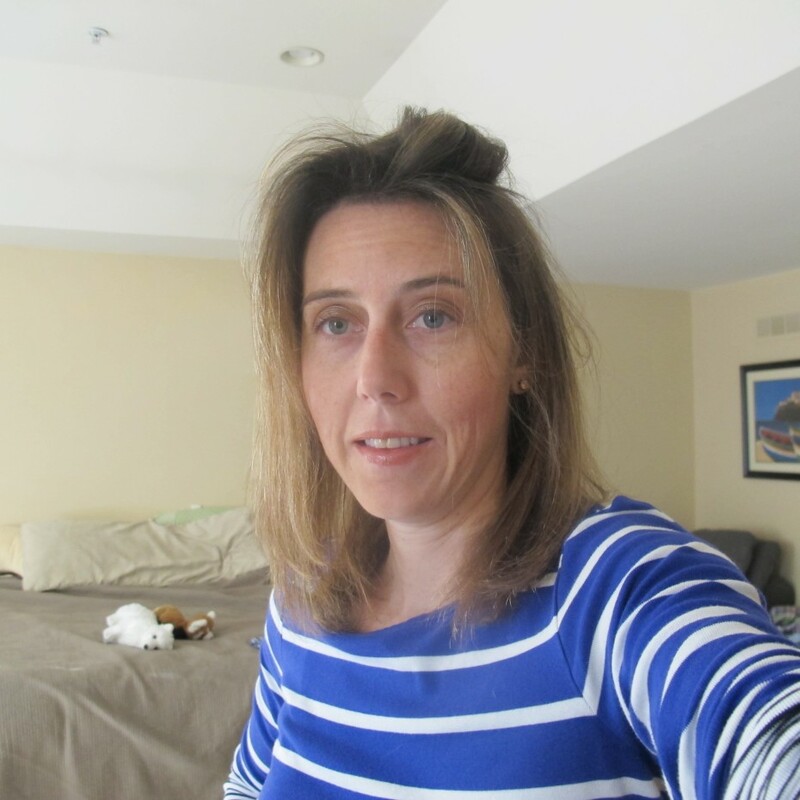 I started with the Infiniti Pro by Conair Hair Designer Dryer. It’s $39.99 which I think is a great price for a hair dryer – especially one as this which is multi featured. It comes with this 3-in-1 styling attachment piece that pretty much eliminates the need for a brush while you are drying your hair. It also claims to reduce styling time by up to 50% and I’ll tell you, it did cut down on my time since I didn’t need to do as much after. Plus, it seemed to dry my hair a lot faster than my usual hair dryer. Probably because I was constantly using the styling piece to brush it? But here’s my FAV part of this product – see that yellowish/cream colored strip on the right? That’s an attached Argan oil strip that distributes Argan oil throughout your hair as you are brushing and drying it. Only a tiny bit. I was worried it would use up quickly or release too fast but I barely noticed the strip being used – I think it’s going to last awhile! Argan oil reduces hair breakage by up to 75% and increases normal shine by up to 25%. The Infiniti Pro by Conair Hair Designer Dryer is available exclusively at Target.com this holiday season for $39.99. Right now Target has a special offer too that you can get a $5 Target gift card when you purchase this product. Sweet! 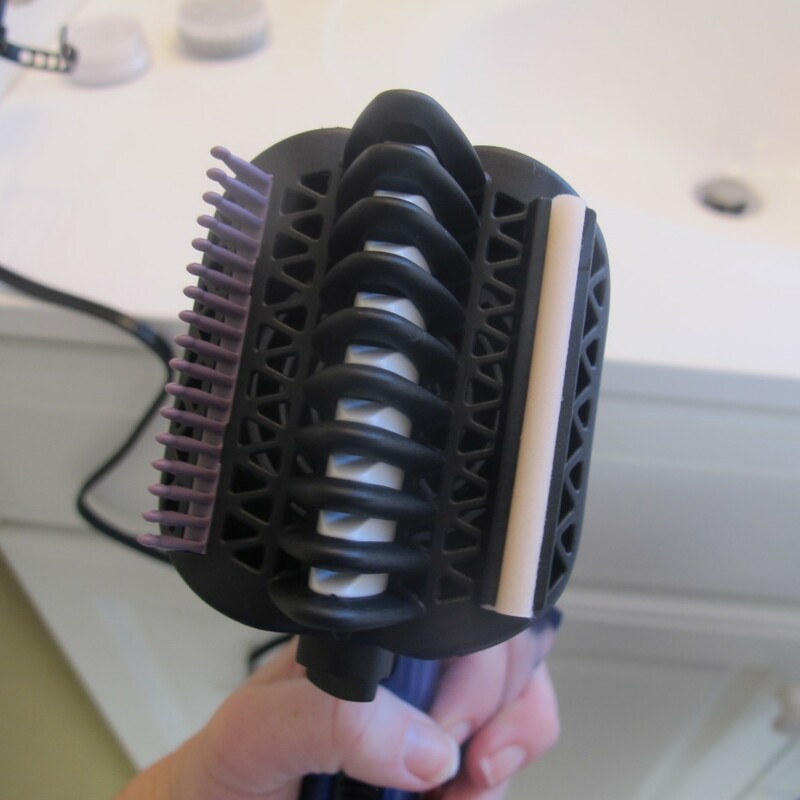 Next I moved onto the true glow Sonic Cleansing Brush by Conair. It has a retail price of $99.99 and it’s a skincare brush for your face. It offers 3 speeds of up to 300 oscillations per second – I’ll tell you guys, the High setting is like having a nice facial massage, I could get used to this! So you’re asking yourself why you need this now? Right? Well maybe you aren’t, but I was. I didn’t really know much about skin brushes. 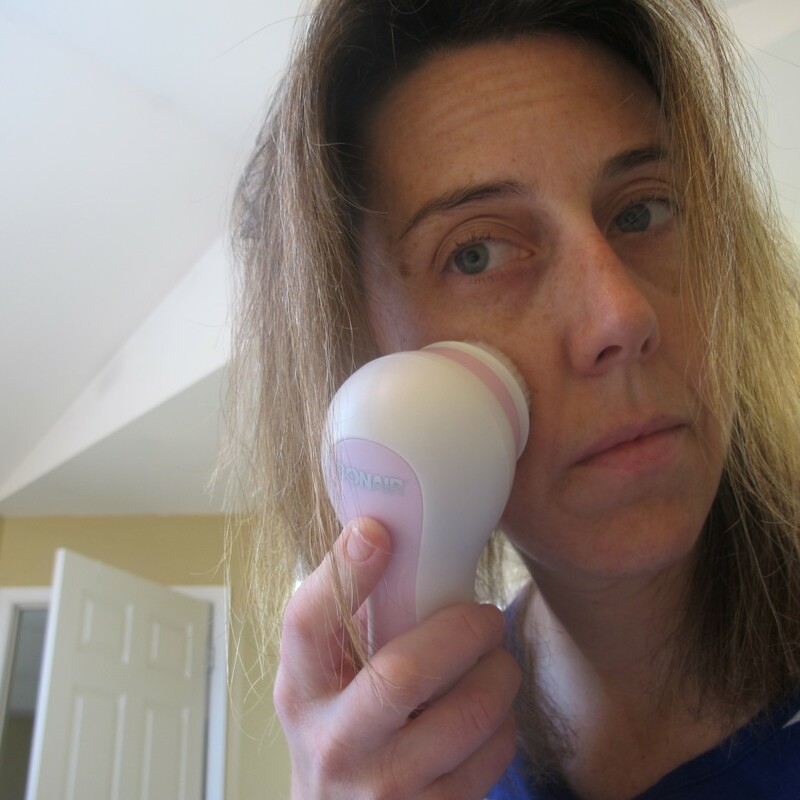 the true glow Sonic Cleansing Brush basically cleans and stimulates your pores. It helps remove extra make-up you may not have gotten to, dirt and helps stop and deal with forming blackheads, preventing them before they turn into a zit! That’s kind of nice but as someone who doesn’t get zits much these days I wasn’t sure what I would think. It comes with two brushes – one for the face and one for the rest of the body and it’s gentle so you can use it with your choice of a mild cleanser if you so choose. It comes with a rechargeable base and the two brushes I mentioned above. You can buy it for $99.99 online or at any mass, drug or specialty beauty retailer. Here is the Conair true glow Sonic Cleansing Brush on Amazon for $99.99. So here’s me after! I know a picture doesn’t show much in the way of how my skin feels but trust me, it feels great and you can see that my hair is dry! Overall time with both products that I spent was 20 minutes. 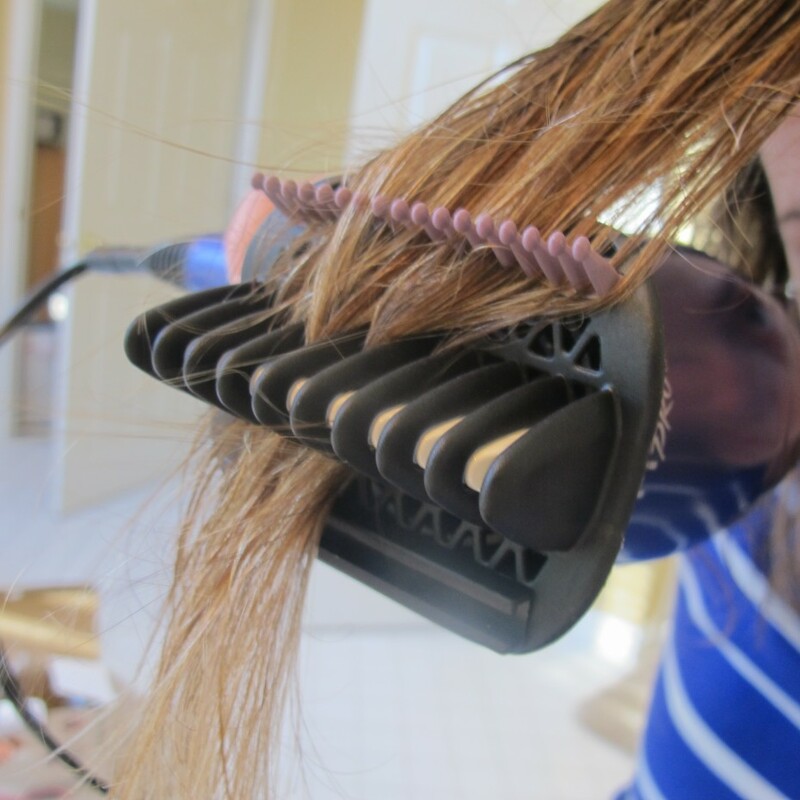 Like Conair on Facebook for more information on their products.